Tom Hopkins, a human services professional with more than 30 years of experience working with people with disabilities and their families, was born in Chicago and educated at Loyola University, the University of Illinois and the University of Hartford. He began his career here in New York providing direct care in a group home in 1980. He has been working his dream job as President & CEO at EPIC Long Island since 2008. Lawrence Boord, CPA has served as EPIC Long Island’s Chief Financial Officer since December 2012. 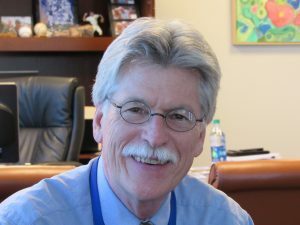 He previously served as Controller of Children’s Health Fund, where he oversaw the financial management of a national program of health centers and crisis relief programs for underserved children. He brings over 20 years of experience to his position at EPIC Long Island, all of it in the Non-Profit healthcare sectors, including 9 years as Assistant Vice President of Finance Metropolitan Jewish Health System where he focused on their managed care programs. He earned his BA at CUNY/Queens College and is a member of the American Institute of Certified Public Accountants and The New York Society of Certified Public Accountants. Larry lives in West Hempstead with his wife and 3 children. Paul began his career with the Epilepsy Foundation of Long Island (EFLI) in 1992 as a Direct Support Professional. His strong work ethic, drive, and commitment to quality care quickly led to a series of promotions. Under his direct leadership, the Residential Program that now includes 17 operational homes throughout Nassau and Suffolk Counties has grown by 50% since 1998. Paul works collaboratively with the CEO and the senior leadership team to facilitate strategic planning with a concentrated focus on program and workforce development; retention of service quality; and key stakeholder satisfaction. Paul earned his Bachelor of Arts in Psychology and his Master of Science in Healthcare Administration from Stony Brook University. Paul’s intricate knowledge of direct services coupled with his ability to drive and develop a talented team of professionals has turned what was once a career stepping stone into a lifelong passion. Jennifer Colbert, LCSW joined EPIC Long Island in July 1998, providing individual, family, group, and couples therapy, as well as running the Parent Support Group and the Professional’s Support Group for people with epilepsy. In 2001, Jennifer became Clinic Administrator and continued in a number of leadership roles through the years until becoming Vice President of Clinic Services in 2016. Collaborating with colleagues through the years, Jennifer has brought innovative programs to EPIC Long Island’s clinics. In March 2009, Jennifer spearheaded the effort to obtain a license for EPIC Clinical Care, which established a mental health service component of the clinic to provide services to adults dealing with emotional and psychological issues. Jennifer collaborated with South Shore Child Guidance resulting in their joining EPIC Family of Human Service Agencies. In 2016 she obtained approval for serving children’s to our mental health clinic. Also in 2016, Jennifer collaborated with co-workers to create EPIC Medical Services, which provides in-home clinic services to people who have intellectual and developmental disabilities. Jennifer trained at the Long Island Center for Modern Psychoanalysis and is a member of the National Association of Social Workers. Prior to EPIC Long Island, Jennifer worked at The Early Childhood Development Center at Schneider Children’s Hospital and also at the Long Island Breast Cancer Support Center and Hotline at Adelphi University. After earning a Bachelor’s degree in Psychology and a brief period working for the State of New Jersey, Gladys joined EPIC Long Island in 1977 as an Outreach Specialist. Gladys quickly realized she had a passion for working in the human services industry, particularly with intellectually challenged adults. She moved into various management roles in the Day Habilitation Program, including serving as the Director of Day Services for over 13 years. Gladys earned a Masters of Social Work degree from Adelphi University and is a New York State Licensed Clinical Social Worker. Currently, she is the Director of Intake Services and a therapist for the Article 16 Clinic. In addition to her role at EPIC Long Island, Gladys serves as a Board member of a not-for-profit organization that aides economically disadvantage children. Eileen Colletti has a Bachelor of Arts degree in Political Science from the Catholic University of America in Washington D.C. While working with nonprofits in the New York area, she went on to receive a Master’s in Public Administration from New York University’s Robert F. Wagner Graduate School of Public Service. Eileen joined EPIC Long Island in February 2013. Her background includes raising private support for social service agencies, health and higher education organizations, including Patient AirLift Services, New York Foundling, Manhattan Eye, Ear & Throat Hospital, New York University and as a consultant with J.C. Geever, Inc., a fundraising consulting firm. She has more than a decade’s experience implementing both capital and annual campaigns. Christine joined EPIC Long Island in 2016 as the Director of Corporate Compliance and Privacy Officer. In these roles, she monitors the performance of the Compliance Program with a goal of improving its effectiveness. Christine works collaboratively with the Director of Quality Management overseeing a team that develops, applies and maintains quality standards for the programs and clinics and ensures adherence to both internal and external standards. Prior to joining EPIC Long Island, Christine worked with Medicaid Community-Based Programs under the auspices of Office of Children and Family and Office of Mental Health. She conducted internal audits that adhered to Federal and State mandates as well as monitored external audits for children/youth in foster care, juvenile detention and youth that are being discharged from Residential Treatment Facilities. Christine earned her Bachelor’s Degree in Forensic Psychology and Master of Science in Education (School Counseling) from St. John’s University. Shari graduated from Adelphi University in 1987 with an MSW degree and began a private therapy practice that continues to thrive. While maintaining private clients, Shari has worked in outpatient substance abuse programs as well as alcohol day treatment centers in both clinical and supervisory positions. She worked for ten years at Suffolk County Probation in the mental health juvenile justice program, followed by a position as a family therapist at a residential school for emotionally disturbed girls. In her capacity as a family therapist, Shari began her affiliation with EPIC Long Island, working as a consultant in the clinic. In 2009, Shari worked with her EPIC Long Island colleagues to develop a mental health clinic licensed to serve the broader community and became the first Director of the Mental Health Clinic. Shari was instrumental in developing the strategic alliance with South Shore Child Guidance. In 2016 Shari oversaw the addition of EPIC’s Children’s Clinic. In addition to obtaining her LCSW, she spent thirteen years training at the Long Island Center for Modern Psychoanalysis. Shari is a member of the National Association of Social Workers. Irene Rodgers is a Licensed Clinical Social Worker who oversees three programs at EPIC Long Island: Medicaid Service Coordination (MSC), Community Habilitation, and Community Education. Irene began her career at EPIC Long Island in 2000 as a therapist in the Article 16 Clinic. She worked with individuals, families, and groups faced with challenges related to developmental disabilities and epilepsy. Prior to joining the EPIC Long Island team, Irene had worked with people with developmental disabilities in the group home and day program settings. In addition, Irene was a Medical Social Worker in a general hospital as well as physical rehabilitation centers. Irene graduated from the State University of New York College at Cortland with a Bachelor of Arts in Psychology and earned her Masters of Social Work degree from the State University of New York at Albany, School of Social Welfare. Allen has been working in the human services field since 1992. Over those years, he has acquired a vast knowledge of the varied needs of the individuals we serve and best practices for care. Allen joined EPIC Long Island in 2001 as an Assistant Manager at our Port Jefferson IRA and since then has demonstrated an unwavering commitment and dedication to the people in our care. Allen is particularly skilled in serving individuals with the most challenging medical and behavioral needs and was active in establishing an EPIC Long Island residence for severely behavioral individuals. The outcomes of this project have been so successful that the model has been endorsed for replication in future projects. Allen currently serves as EPIC Long Island’s Director of Day Services and maintains a strong belief in the benefits of a positive corporate culture. His innovative ideas for Day Habilitation were incorporated into the renovation of our new facility and have benefited both staff and consumers. Allen earned a BA from Stony Brook University in 2008. Fabiola joined the EPIC Long Island family in 2016 as the Director of Quality Management with over a decade of experience in the OPWDD field. Fabiola oversees the Quality Improvement Department and ensures that quality standards are maintained for the individuals receiving services in our programs. She works collaboratively with the Director of Corporate Compliance, where they are both responsible for a team that develops, applies, and maintains quality assurance in accordance with state and federal regulations. Fabiola has an MBA from CW Post. Amy Walsleben has worked in the field of developmental disabilities for over 38 years. She has been employed with EPIC Long Island since 1989 where she began as Treatment Team Leader in the Residential program. As the agency’s first Training Coordinator, Amy established EPIC Long Island’s first Agency Orientation program and developed various employee training manuals to educate new employees. In 1998, she was appointed by the Executive Director to a newly established position at EPIC LI, Director of Quality Improvement, and continued in that position for over 9 years. During that time, she developed and implemented quality assurance and quality improvement systems to ensure the highest level of quality care for all individuals. Amy has been the Director of Residential Services since 2008. She is committed to providing fulfilling and enriched life experiences in a 24-hour supervised setting for individuals with developmental disabilities who may be medically frail, have behavioral challenges, or have epilepsy. Prior to joining EPIC Long Island, Amy began her career as a Therapeutic Recreation Specialist at an adult day treatment program and was later promoted to Program Supervisor. Amy served as a volunteer Chairperson on the New York State Surrogate Decision Making Committee, Commission on Quality of Care and Advocacy for People with Disabilities from the time of the program’s inception in 1999 until 2005. Amy graduated from the State University of New York College at Cortland with a Bachelor of Science degree in Therapeutic Recreation and earned a Master of Science degree in Therapeutic Recreation from Northeastern University, Boston-Bouvé College in Boston, Massachusetts.